If you have the extra time and money, it is well worth climbing Kilimanjaro via the Machame route with an extra day for acclimatization. This extra day will help you acclimatize even more than on the standard 8 day Machame route, which means you should have an even better change of making it all the way to the "rooftop" of Africa! The extra acclimatization day makes this a 9 day adventure. The climb itself takes 7 days and 6 nights and we include one day before and after the climb in a comfortable hotel in Arusha. Excluded: Flights, Sleeping bag, Optional activities, Alcoholic and soft drinks, Visa fees, Tips, Personal spending money (for souvenirs etc), Travel insurance, etc. Arriving at the Kilimanjaro airport, you will be greeted by our local driver and transferred to your hotel in Arusha. The rest of the day will be yours to do as you please; you may choose to relax at the hotel or explore the small town of Arusha (a short taxi ride away). You will have a preparation talk to help you prepare for your Kilimanjaro climb via the Machame route. After breakfast you will be picked up from your hotel and taken to the entrance to the Kilimanjaro National Park. The drive there takes about 45 minutes. While your guide takes care of the paperwork, you can watch the mountain team preparing for the climb – it is always impressive ‘what’ and ‘how’ everything is carried up the mountain. Once everything is done, your Kilimanjaro adventure will begin. You will quickly be deep within the magnificent mountain rain forest with ancient trees, primeval ferns, liana, lichen and moss that carpets the ground and drapes from the trees. With a little luck you might get a glimpse and hear the beautiful black and white colobus monkeys in the treetops. After about 5 – 6 hours, you will reach the destination for today – The Machame Camp – which is situated just above the tree line at 3000m. Here, at the base of the Kilimanjaro, you will have your first dinner and overnight stay at the camp. After an early start, you will leave the Machame Camp where the path steepens and the landscape turns into a moor and heath land, allowing you to take in the impressive mountain range. Today’s stage is shorter than the previous one and by mid-afternoon, you will reach the campsite at the Shira Plateau. The camp offers a breath-taking view of the mountain and during sunset, the warm evening sun lights the rock face and glacier of Kibo. Today you will climb around 700m but you will be camping at an elevation only slightly higher than the previous night. This will allow your body to acclimatize as a height of over 4500m will be reached during the next two days before descending again. The trek begins with a long ascent above the Shira Plateau in the direction of the Lava Tower Hut (4640m). The vegetation becomes sparser as the landscape moves towards an afro-alpine desert. The trek passes through the spacious and sweeping Barranco Valley with its giant senecio and lobelia plants. After 6 – 7 hours, you will arrive at the Barranco Camp. We camp here for the night, enjoying a good evening meal. The treks today starts with the imposing "Barranco Wall". It might look scary, but the climb up the cliff face is easier than it looks. There is no real climbing involved, but you could use your hands once or twice just to be on the safe side. And of course the guides will be there every step of the way to lend a helping hand. The route with its numerous ascents and descents allow for further acclimatization, and soon you will reach the mountain ridge. Walking along the ridge you can take in the beautiful landscape with its stunning contrasts before finally reaching the cloudy Karanga Camp. You trek will take between 3 - 4 hours, leaving more than enough time to rest and relax. Evening meal and overnight at Karanga Camp. This is where the extra acclimatization day comes in. On the standard Machame route, climbers only stop for lunch in the Karanga valley and then continue onward to Barafu Camp. The climb to the summit begins at midnight after you had some hot tea and a light snack. You will start by climbing the screes of the Kibo, only lit by headlamps. After 5 – 7 hrs of climbing in the dark, you will arrive at Stella Point at the rim of the crater of Kilimanjaro. 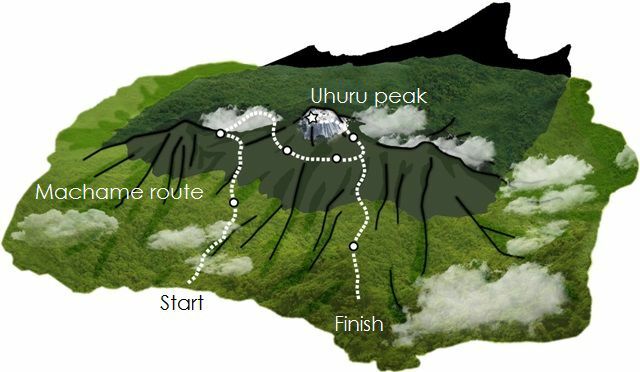 Another 1 – 2 hrs climb along the crater ridge will lead you to the summit at Uhuru Peak (5895m)! You have reached the summit of Mount Kilimanjaro and the “Roof of Africa“! Here, you will witness Kilimanjaro in all its glory, enjoying its surrounding landscape being lit up and warmed by the rays of the sun – a truly liberating experience. The simple descent runs almost along the same route and just before midday, you will arrive back at Barafu Camp. Here the rest of the mountain crew will have waited for you and upon your return will provide you with a warm meal. After a well-deserved break of 1 – 2 hrs, you will be on your way to Mweka Camp (3080m) where an evening meal and a well earned sleep awaits you. The final leg of your amazing adventure begins after breakfast with a traditional farewell ceremony from the mountain guides. Then a gentle 2 -3 hrs descent through the rain forest continues to Mweka Gate where your driver takes you back to your hotel in Arusha. Once back in Arusha, you can just relax and relieve your aching muscles in the pool and enjoy the warm sun. After breakfast, your adventure comes to an end. From here you can continue with your travel plans or be transferred back to the Kilimanjaro Airport. To help with the planning of your trip, you are more than welcome to book these hotels before and/ or after your trek through us. These hotels are either the starting or end point of your tour, or it will be conveniently close to it. These hotels also offer airport transfers. For information on prices, just click "Hotels and Transfers" at the bottom of this page. The Meru View Lodge is a tranquil haven of peace set within a ten acres complex and is halfway between Arusha and the Kilimanjaro Airport. It's close to the all tourist attractions and the Arusha National Park. It offers free wi-fi, laundry service, restaurant with gluten-free and vegetarian options etc.